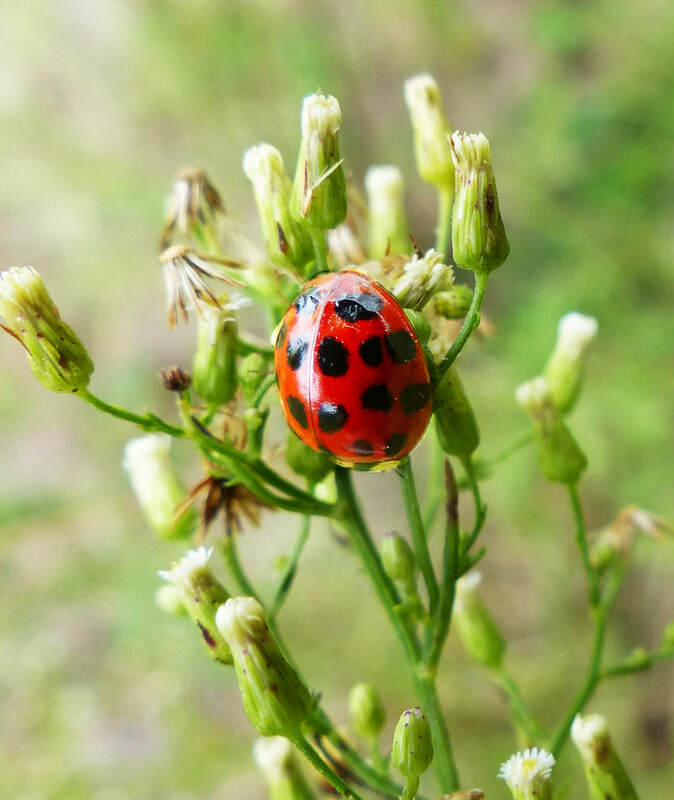 ​Insects have special ways of growing. They grow in stages, not continuously as we do. 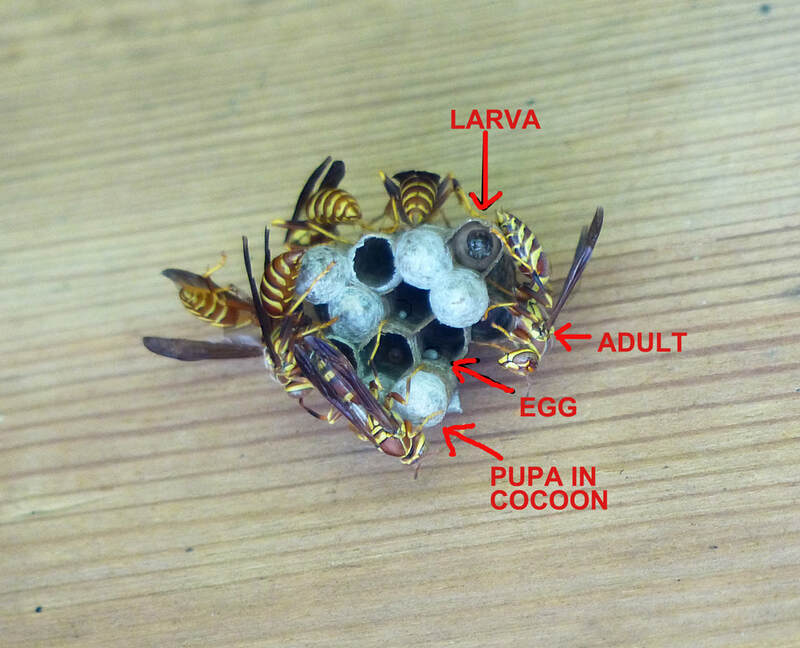 Some insects go through 3 distinct stages after they hatch from an egg and have a totally different form at each stage. 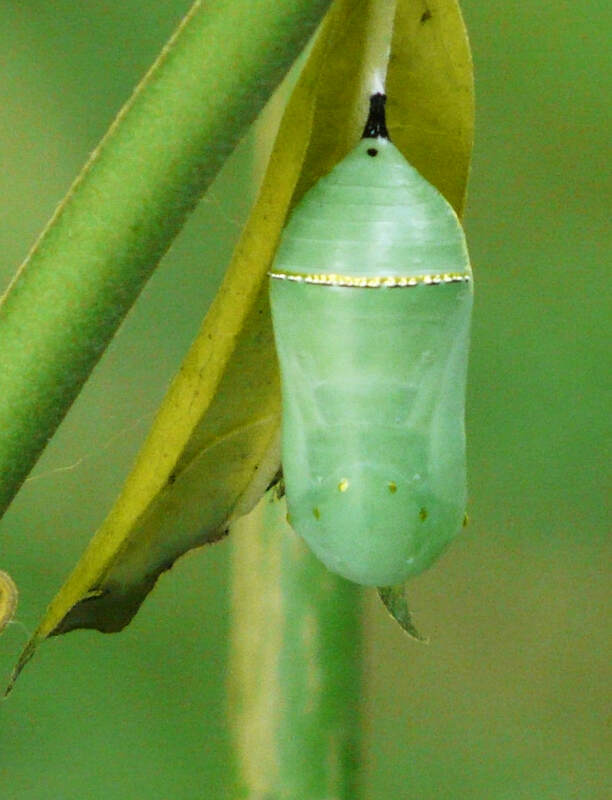 This way of growing is called COMPLETE METAMORPHOSIS. 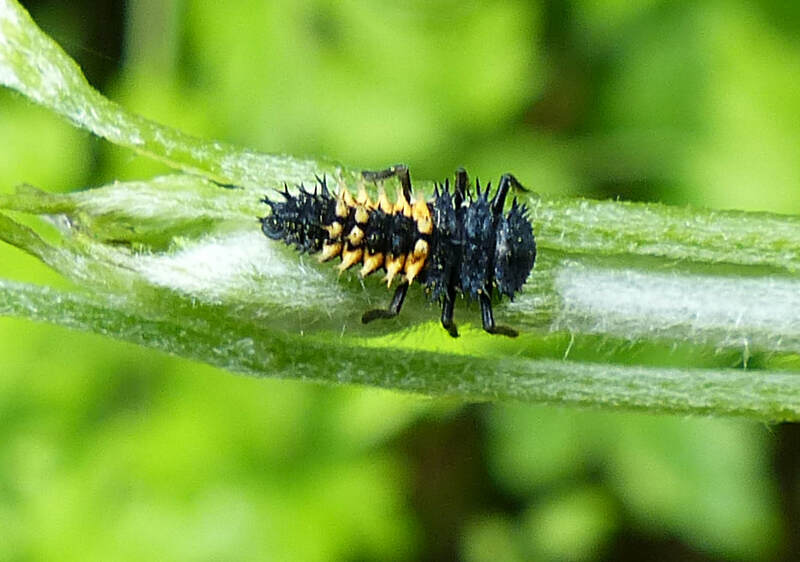 Other insects go through several stages as nymphs. At each stage they become larger, but look somewhat like smaller versions of the adult. When they make their final molt they become adults. This special way of growing is called INCOMPLETE METAMORPHOSIS. 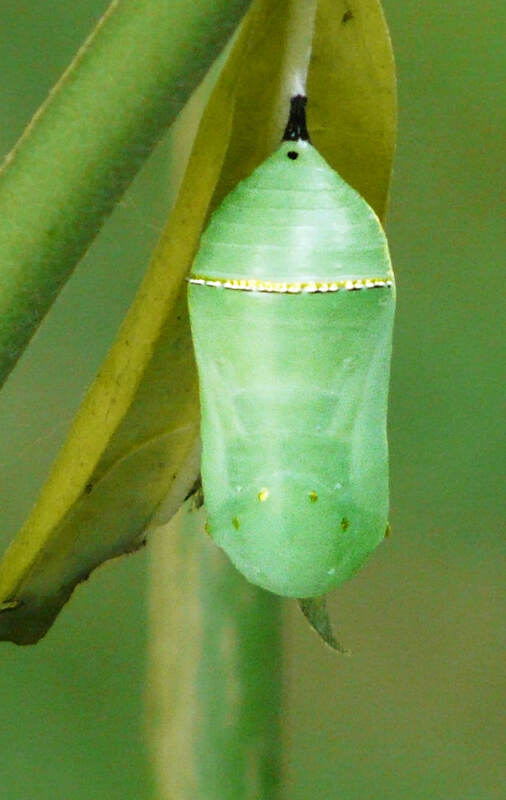 In complete metamorphosis, there are 4 different stages of development: egg, larva, pupa, adult. ​Click on a photo to make it larger. 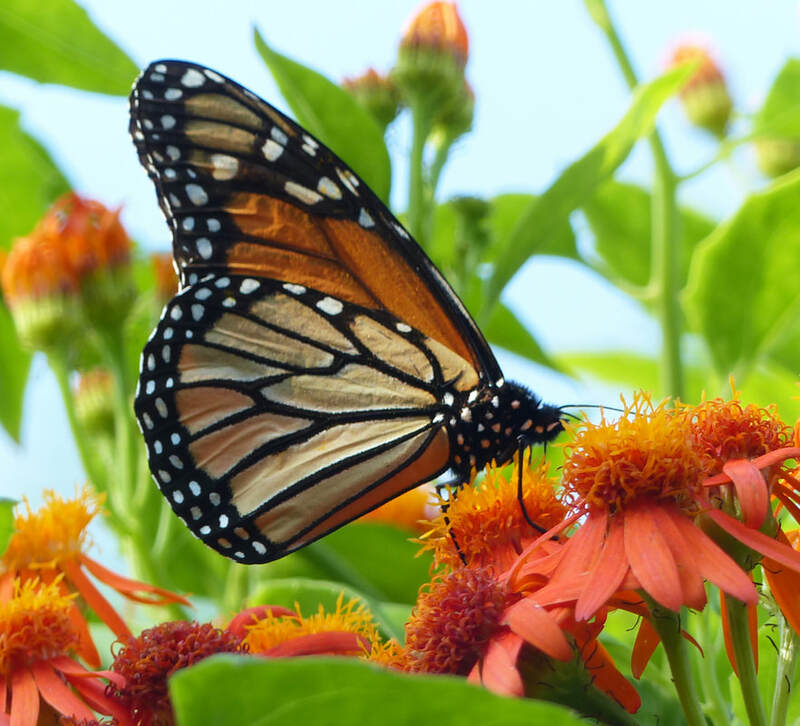 Only butterflies, moths, beetles, wasps, bees, ants, and flies undergo complete metamorphosis. The adult female lays many eggs. 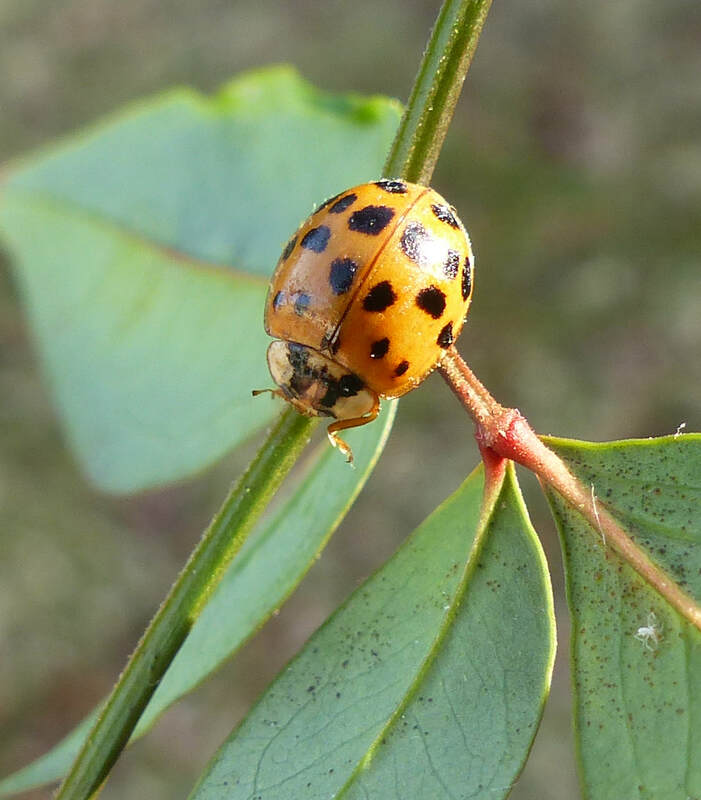 Depending on the insect, they may be on plants, on the water, or sometimes inside another insect. 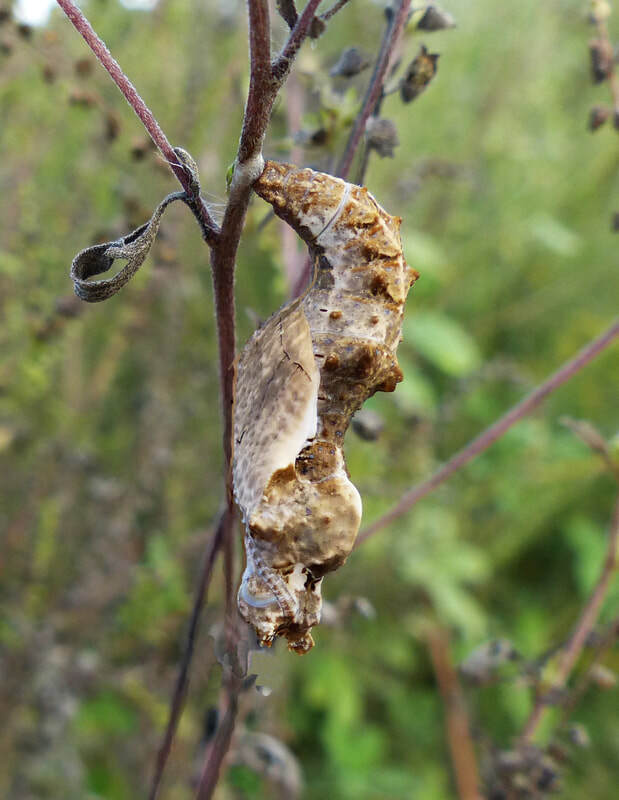 The location ensures that there will be food for the larvae when they hatch out of the eggs. 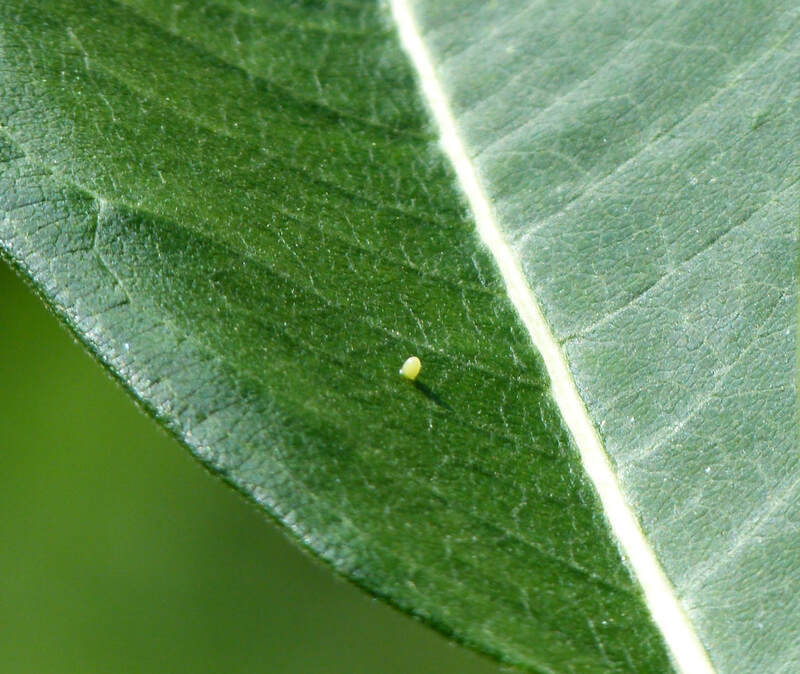 ​After a period of time which varies with different species, larvae hatch out of the eggs. 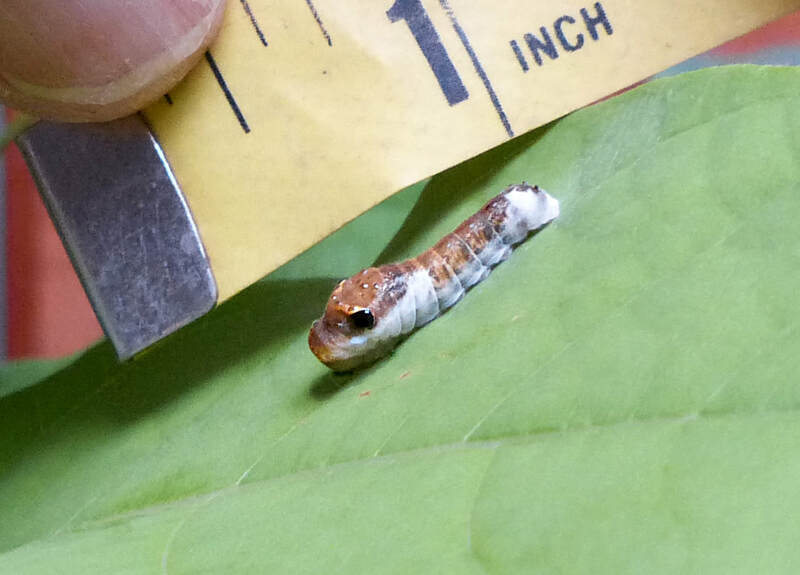 Some of the adults these larvae become may surprise you. 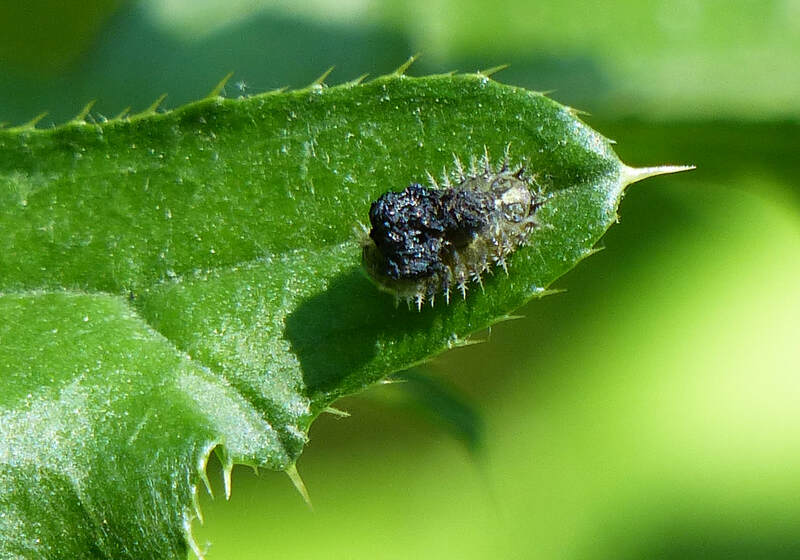 The larvae are often very different from the adults in appearance, habitat, and diet. This ensures that they will not compete for the same resources and helps ensure the survival of the species. 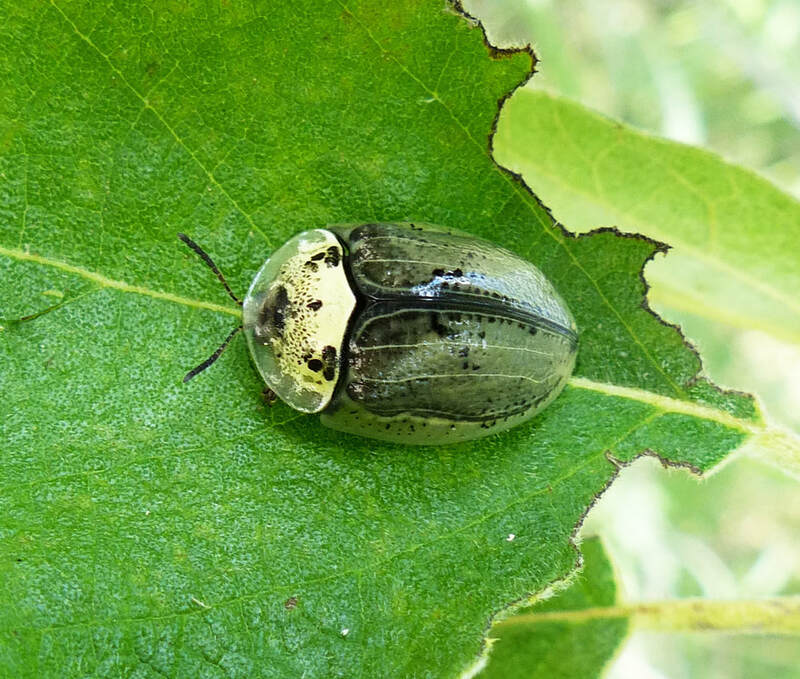 Wild Olive Tortoise Beetle ADULT (Physonota alutacea) The beetle is facing to the left. You can see its antennae. 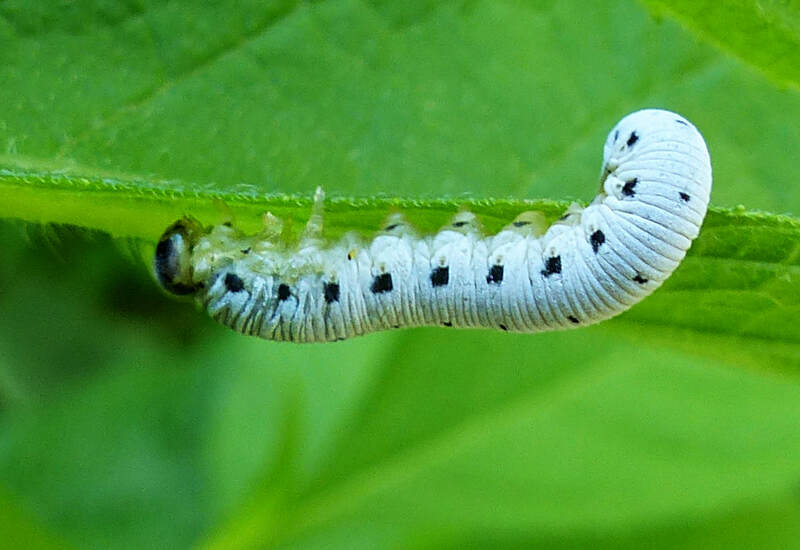 ​Larvae are eating machines. They eat and grow and eat more and grow more. However, unlike humans, an insect’s skeleton is on the outside – where we have skin. This exoskeleton is hard like a suit of armor. The exoskeleton protects the insect. It gives it shape and keeps it from drying out. But, like a suit of armor, the exoskeleton does not grow. To grow larger, the insect must break out of its exoskeleton. This is called MOLTING. Each time it grows too big for its exoskeleton, the insect molts again.. 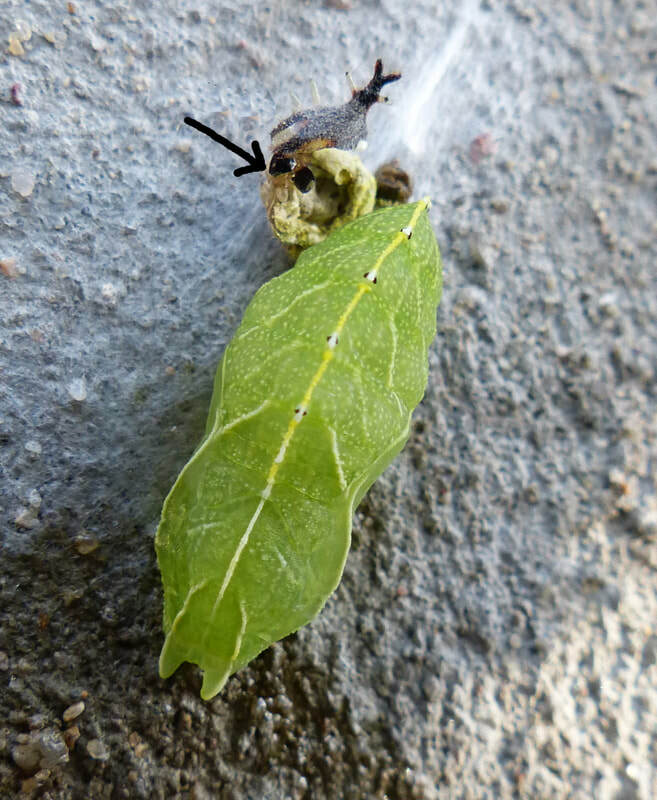 The stage between molts is called an INSTAR. 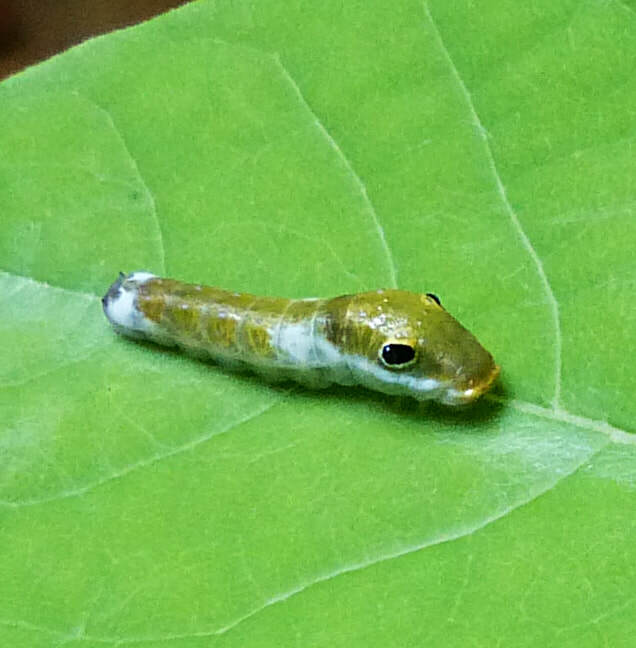 ​The following photos show the instars of a Spicebush Swallowtail Caterpillar (larva) that we raised in our living room. 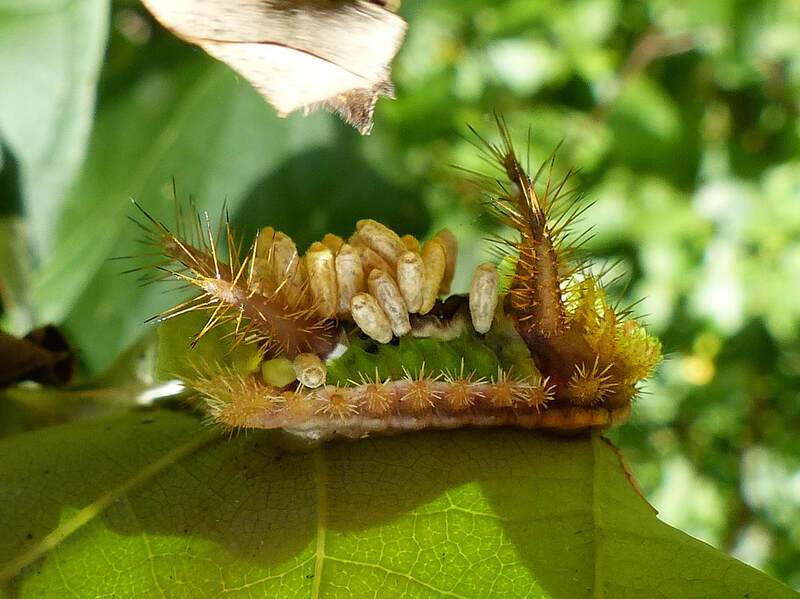 You can see that with each molt it changed from looking somewhat like bird poop to a larger and larger sleek little caterpillar with big eyespots. 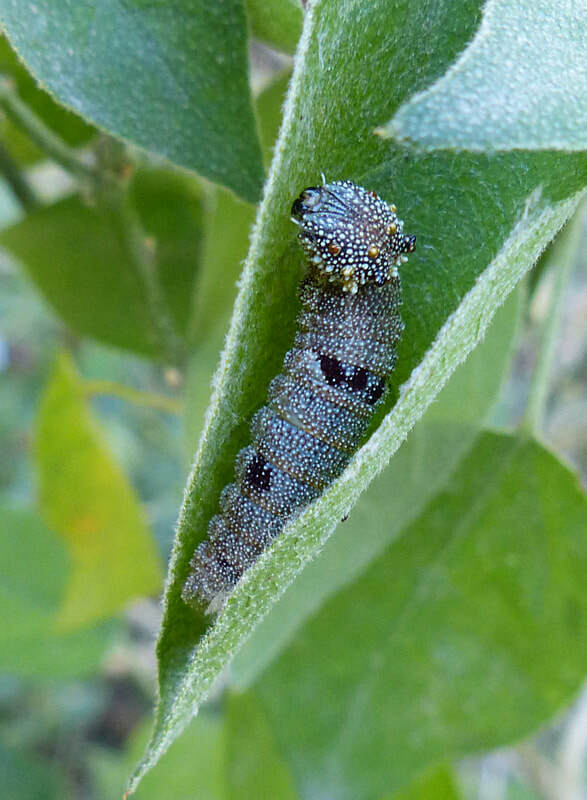 The last instar -- See how the caterpillar has grown and changed. 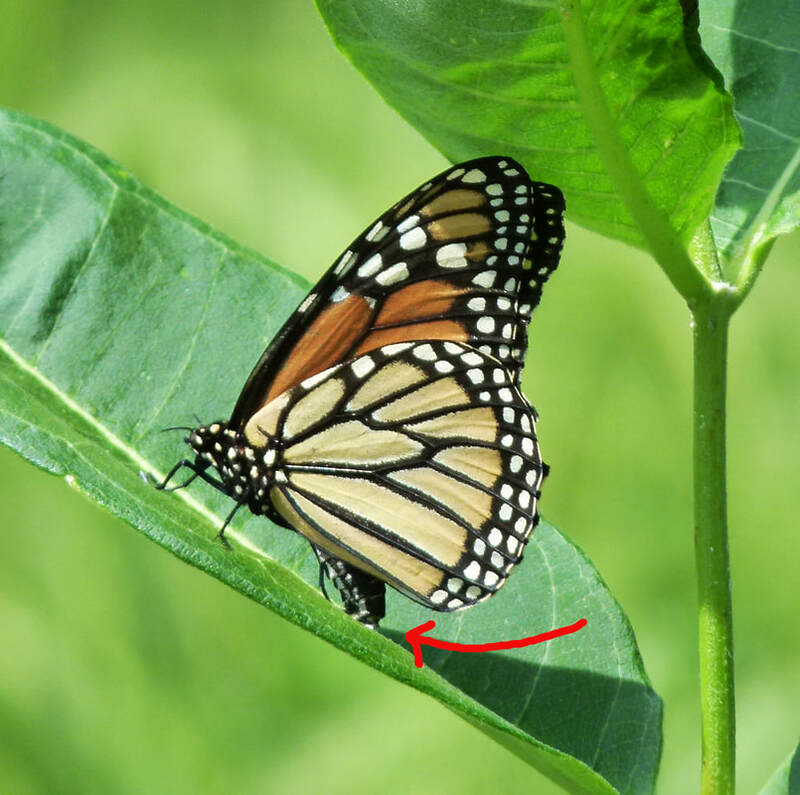 Notice the eyespots on the thorax (back). The head is bent and hidden on the right. 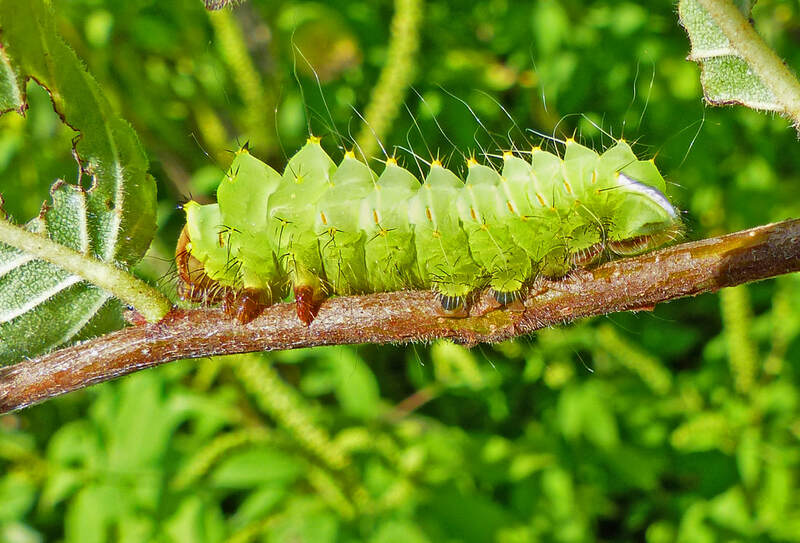 ​When the larva is fully grown, it stops eating. 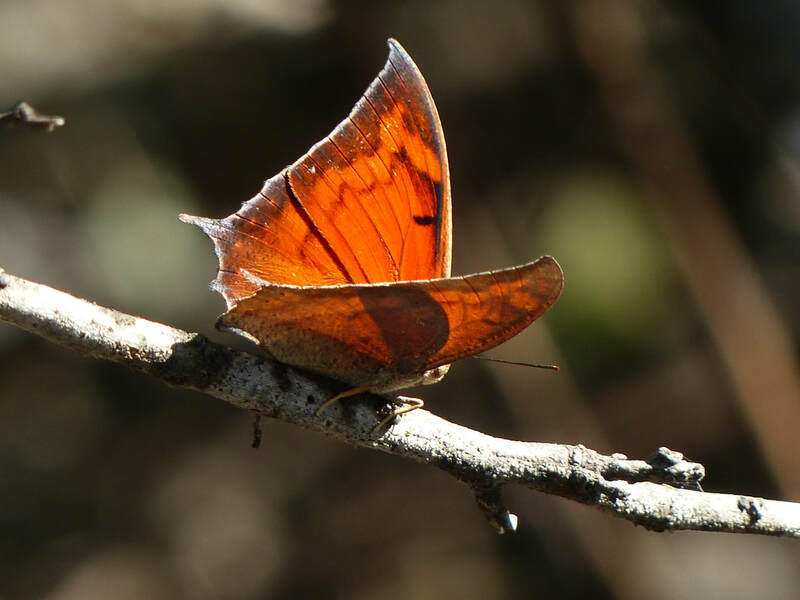 It often attaches itself to a stem or leaf and prepares to pupate. 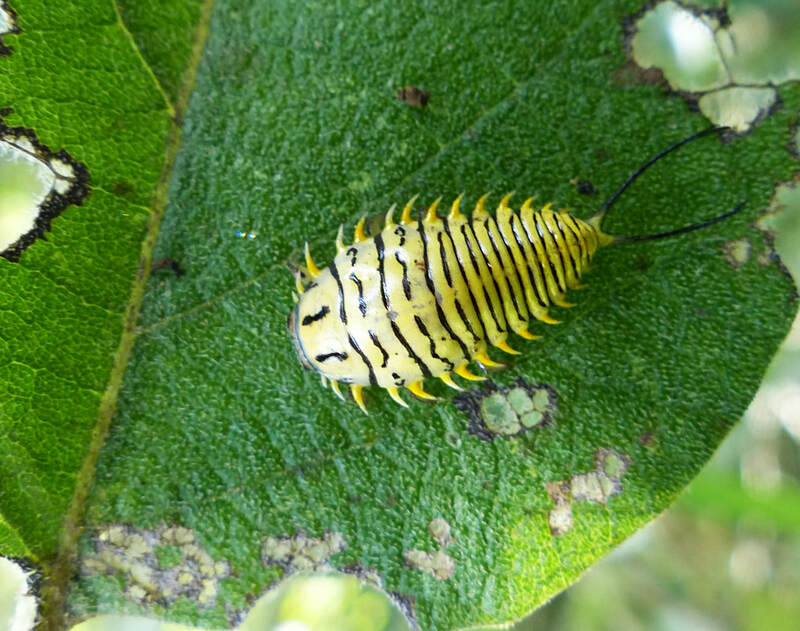 It wiggles out of its exoskeleton to reveal a pupa underneath. 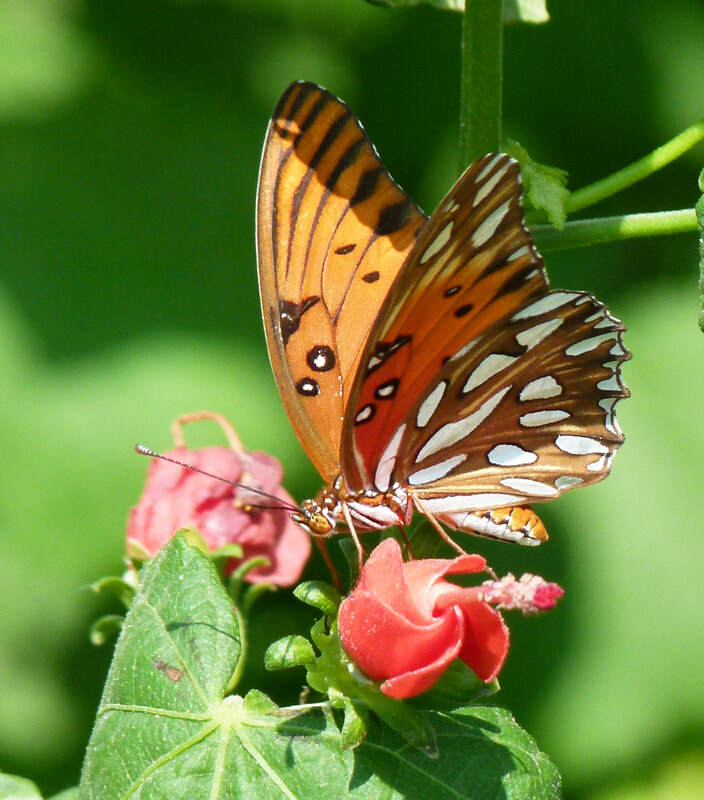 Butterfly pupae are called chrysalids. 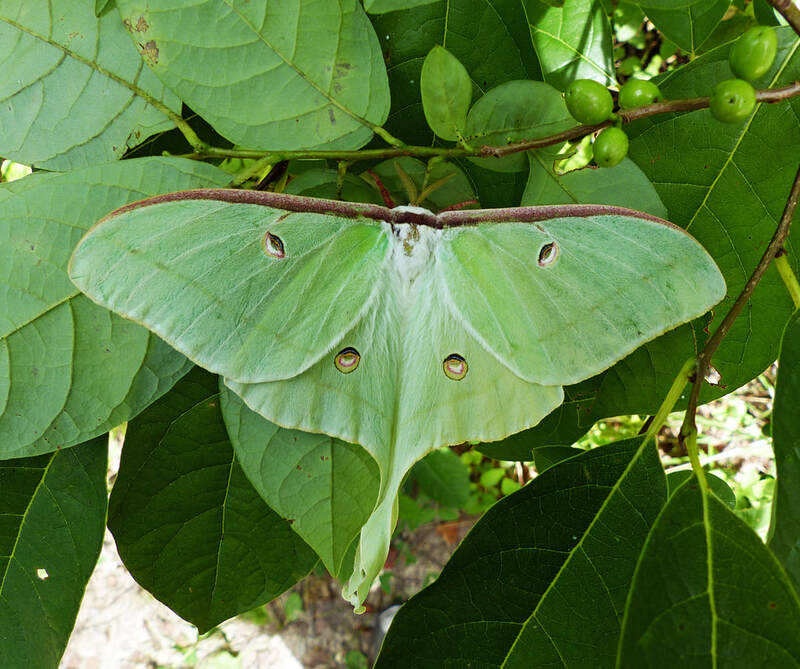 Moth spin themselves a silk cocoon in which to pupate. This seems to be a quiet stage, but it is not. Inside the pupal shell, except for structures such as the circulatory and breathing systems, the tissues of the larva are disintegrating into a cellular soup. Slowly the soup reorganizes itself into adult tissue. 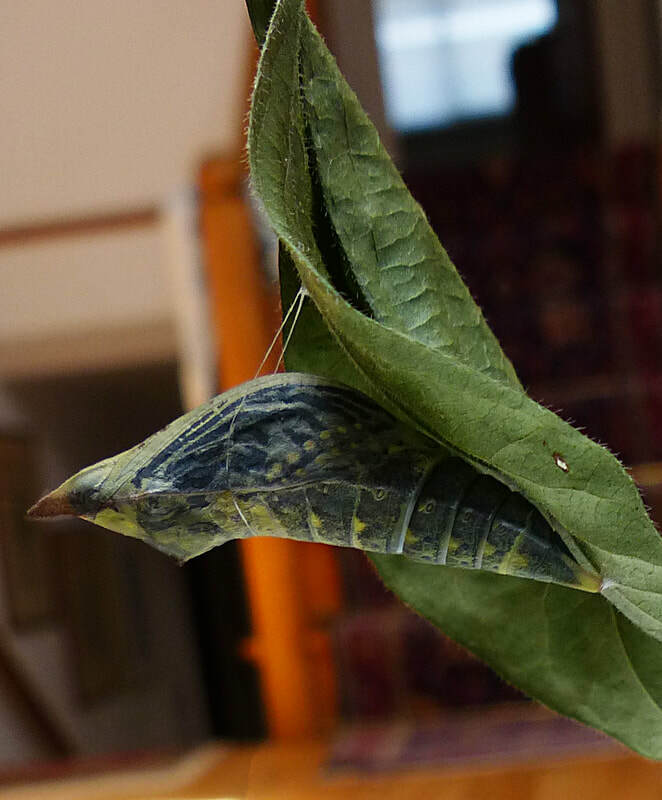 When the pupa is getting ready to emerge (eclose) as an adult, the pupal shell sometimes becomes transparent and you may be able to see the adult inside. 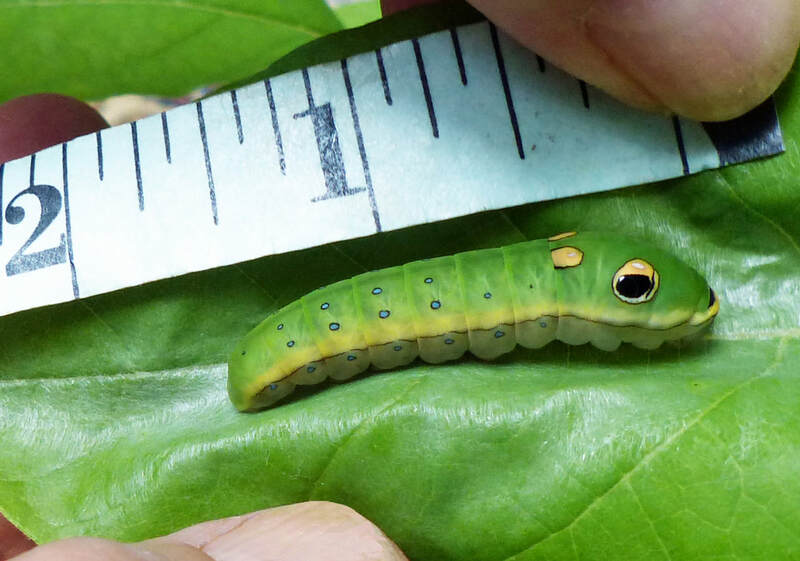 ​In the following photos you can see the Spicebush Swallowtail changing from a larva to a pupa. 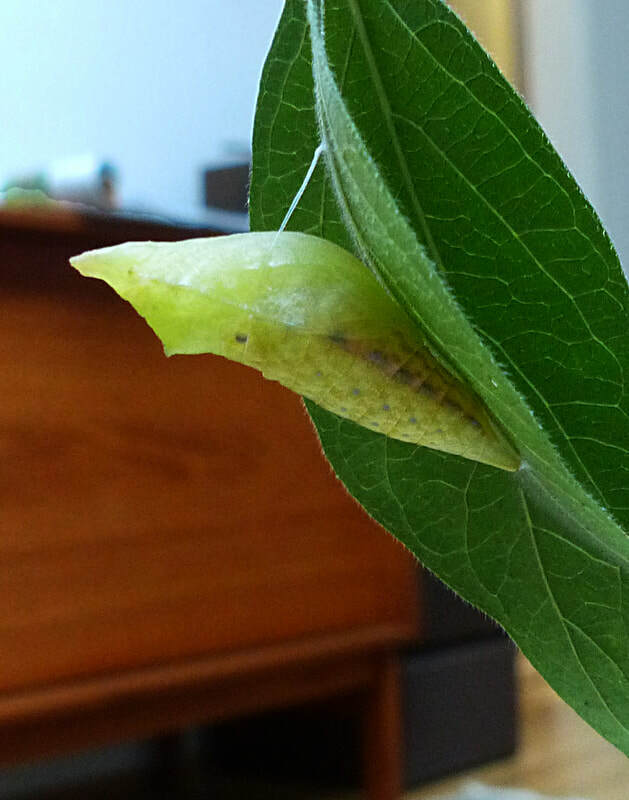 The caterpillar has attached itself to a stem and is preparing to pupate. 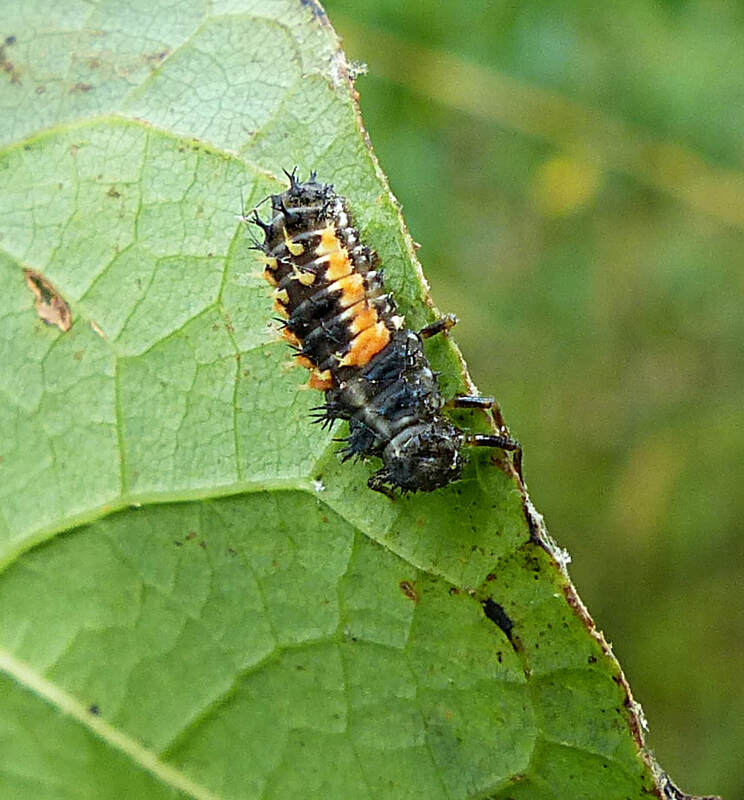 The exoskeleton has split behind the caterpillar's head. 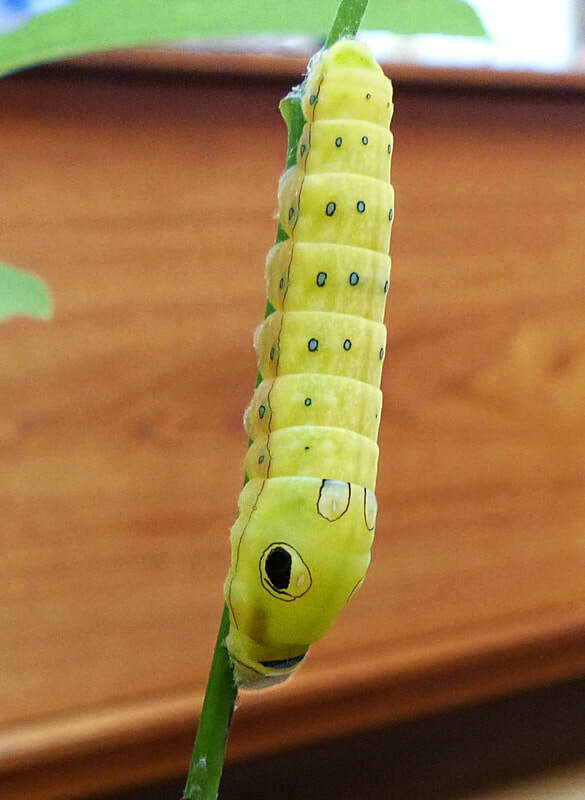 The caterpillar is in position to pupate. 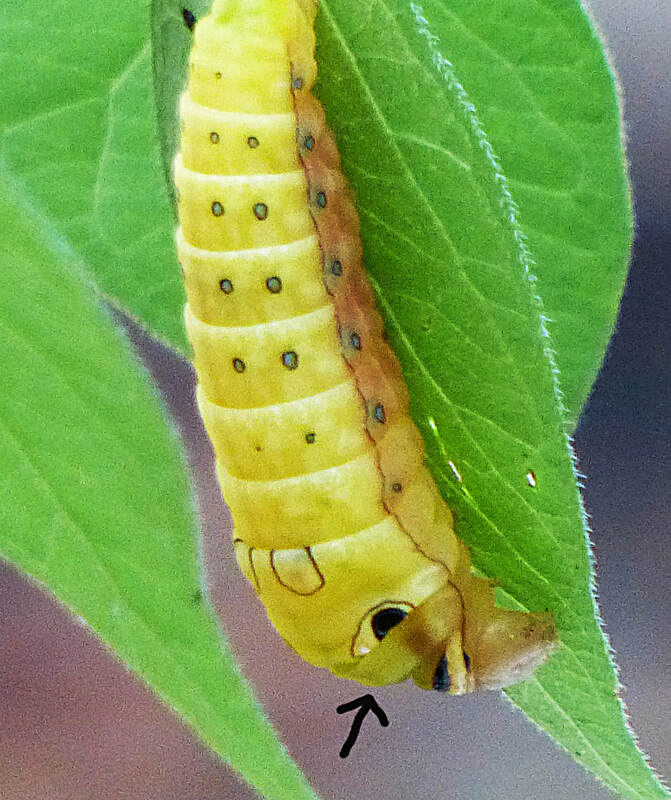 The eyespot is actually split, but because of the caterpillar's position it looks as if the exoskeleton is still whole. 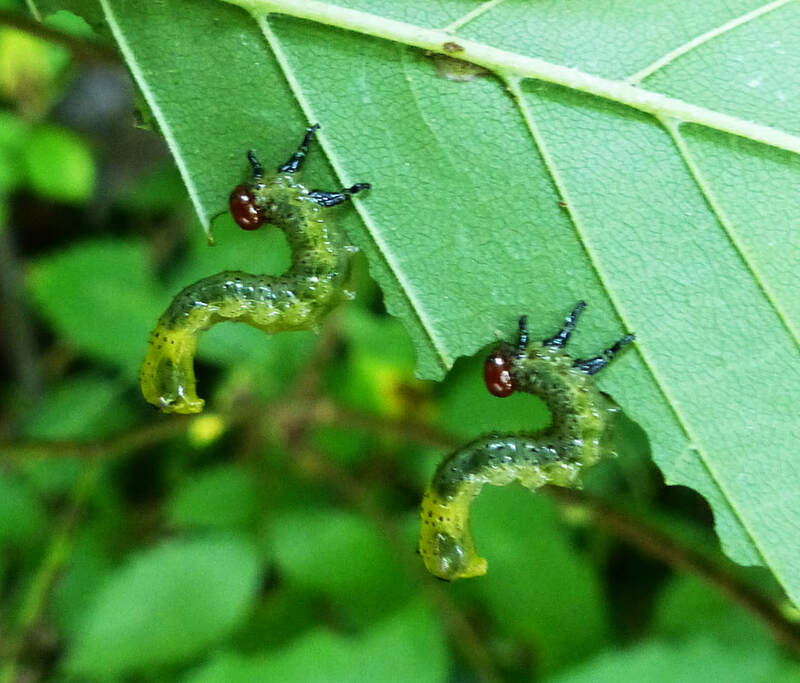 ​The bagworm is a moth which makes a bag of silk, adding pieces of twigs and other plant matter for camouflage. This provides protection for her as she eats and grows. She lives inside, but pokes out her head and legs so she can move around to feed. She pupates at the entrance of the bag. 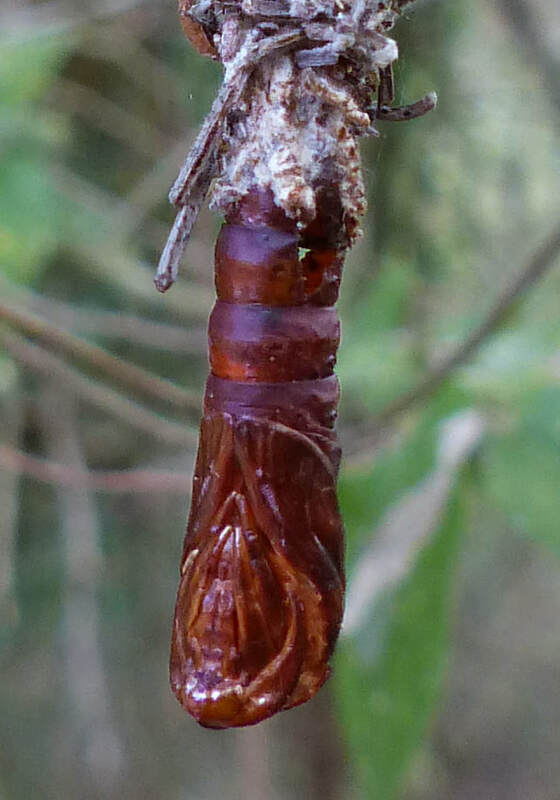 Bagworm (Thyridopteryx ephemeraeformis) PUPA hanging from the end of the bag she has spun and then encrusted with twigs of the tree where she eats. This keeps her well camouflaged. In this closeup of the Bagworm PUPA hanging upside down, you can see the antennae and wings of the adult moth which will emerge. 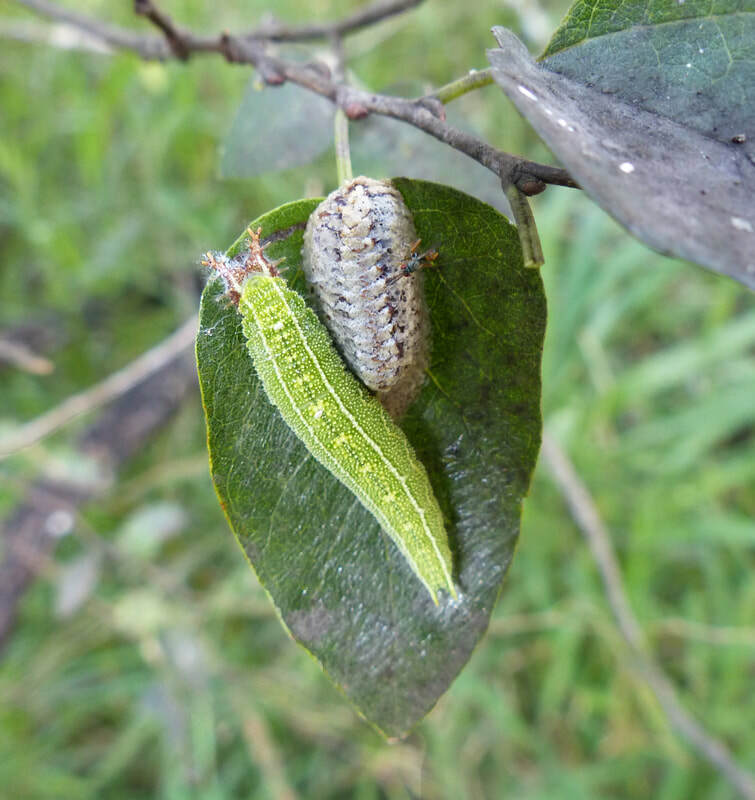 PUPAE of the Leaf Beetle hang from a twig as a Leaf Beetle LARVA moves along the underside. 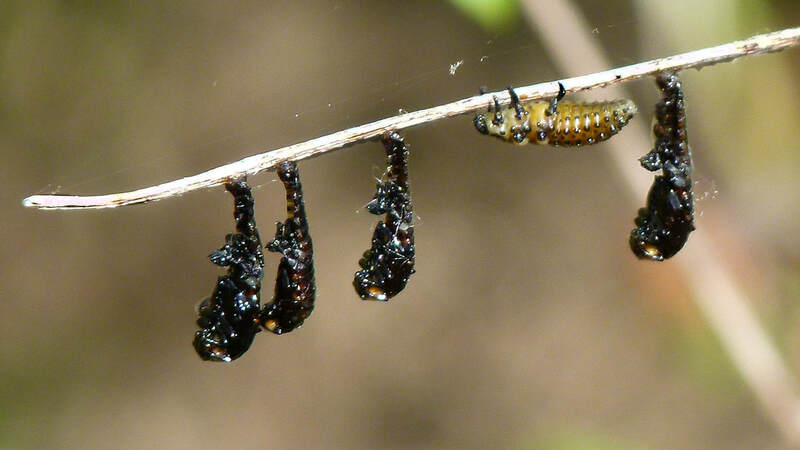 After a period of weeks or even months, the pupal shell starts to split and the adult proceeds to pull itself out. 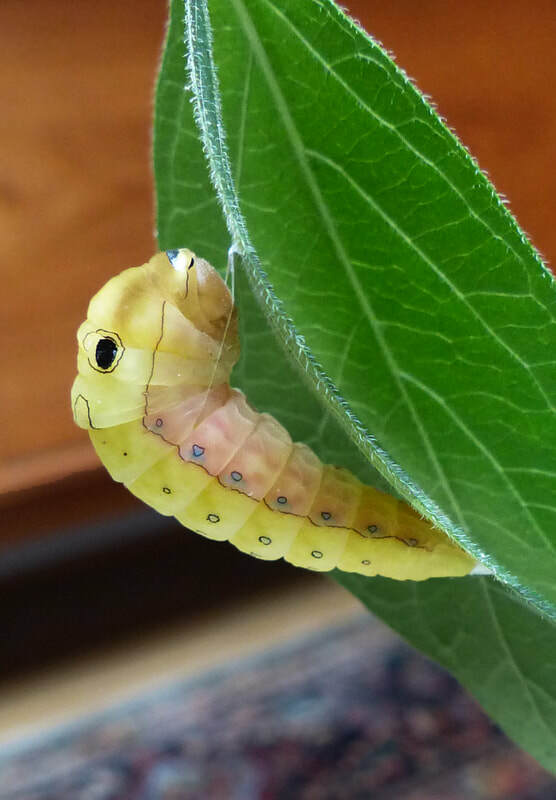 I have not included photos of the Spicebush Swallowtail emerging because it happened so fast that when I left to take a telephone call from our son and came back, the adult had emerged and I had missed it. Alas. 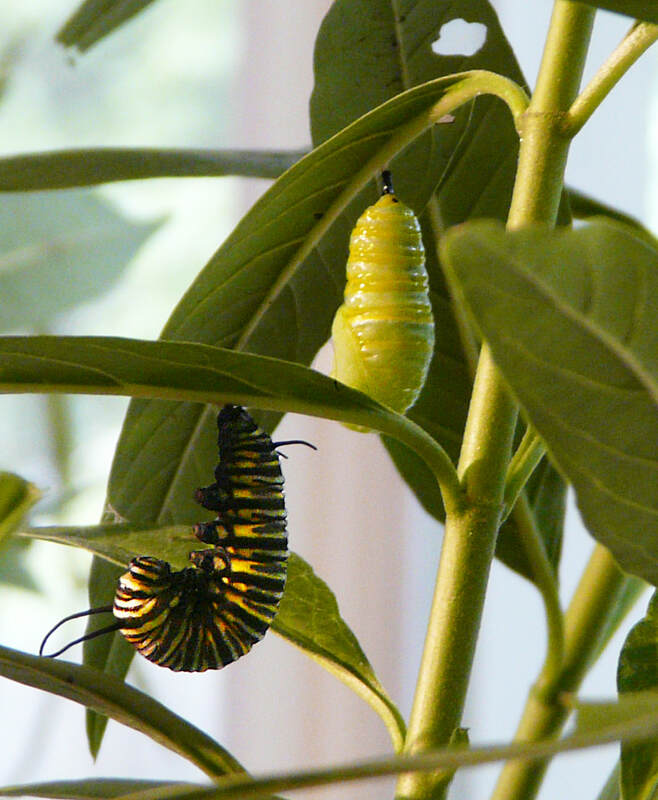 Instead, I am including the pupation and emergence of a monarch butterfly which we raised in our livingroom several years earlier. 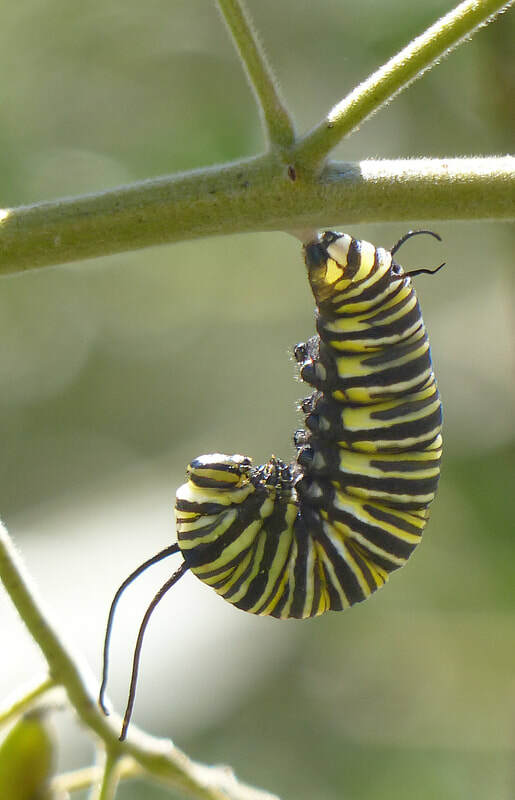 A Monarch Caterpillar (Danaus plexippus) has attached itself to a stem in preparation for pupating. 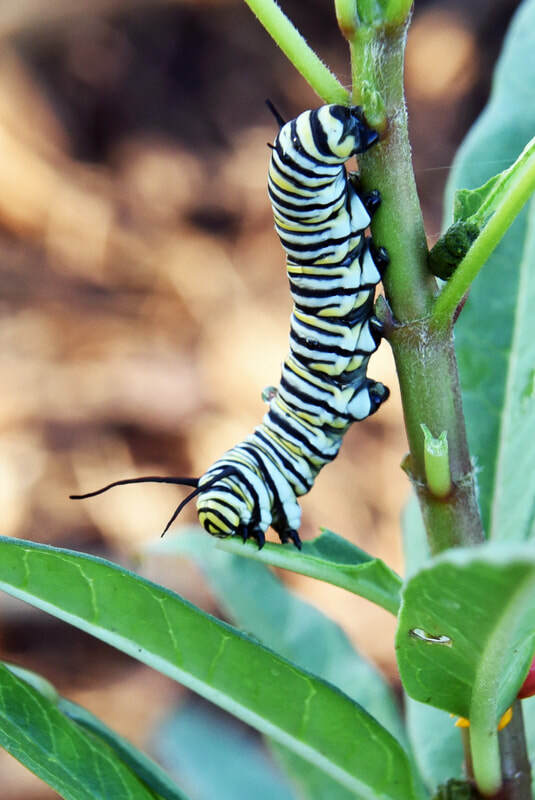 A Monarch LARVA and an early stage PUPA hang from a stem of a milkweed plant. To activate the ​​​​​SLIDE SHOW below, click on "Play" at top left or the arrow at the top right. 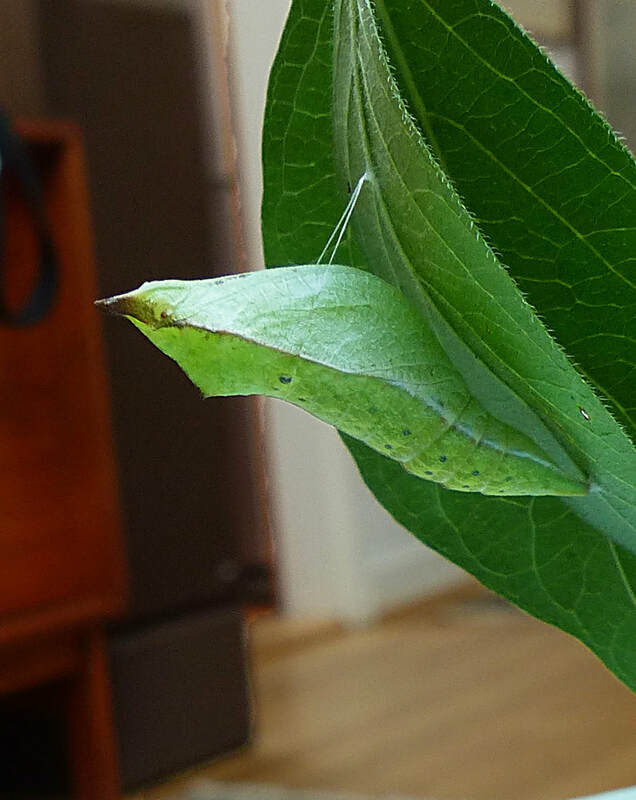 ​Here are some more examples of complete metamorphosis (except the egg which I didn’t find to photograph). 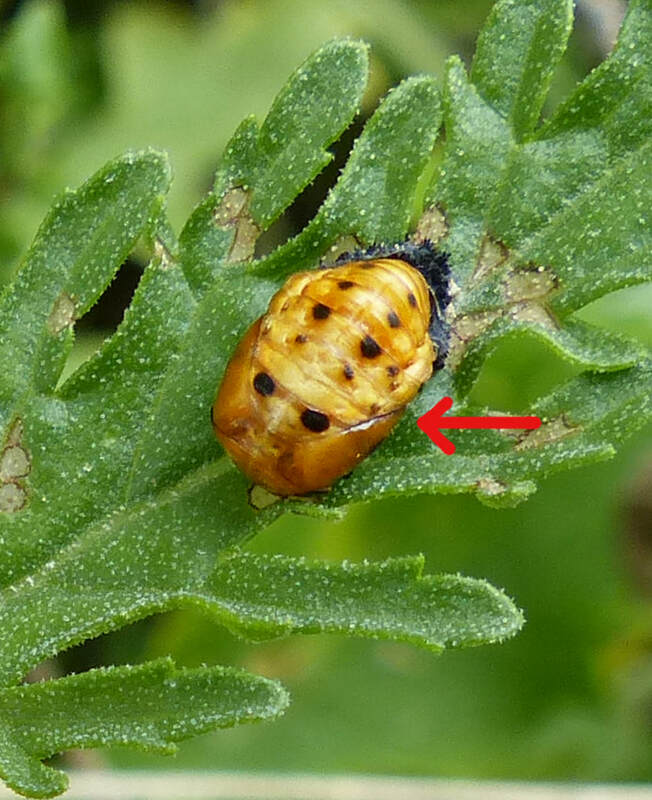 Tortoise Beetle LARVAE carry some of their excrement on their backs, probably to both hide from and deter enemies. 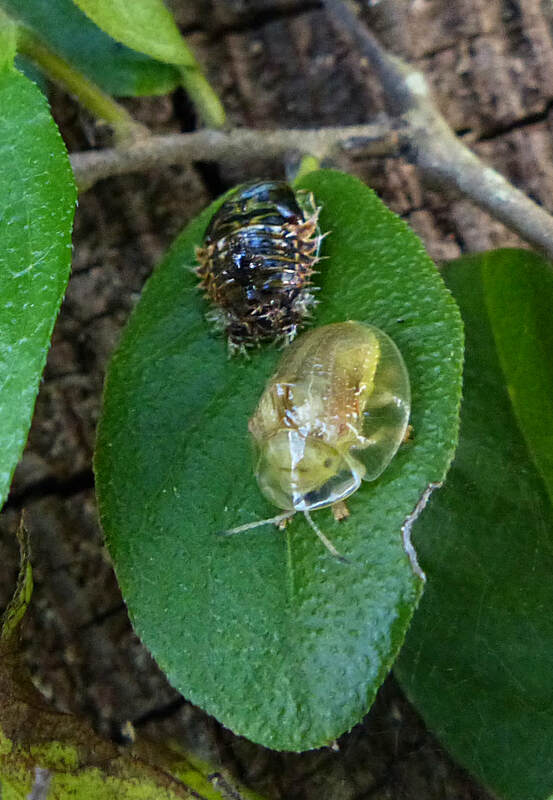 An Anacua Tortoise beetle PUPA and an Anacua Tortoise beetle ADULT share a leaf of the Anacua Tree. 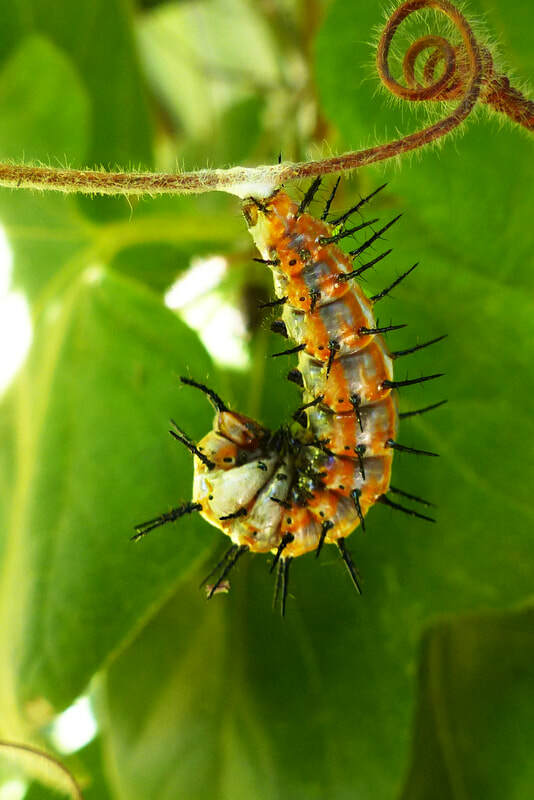 A Gulf Fritillary LARVA (Agraulis vanillae) voraciously feasts on a leaf. 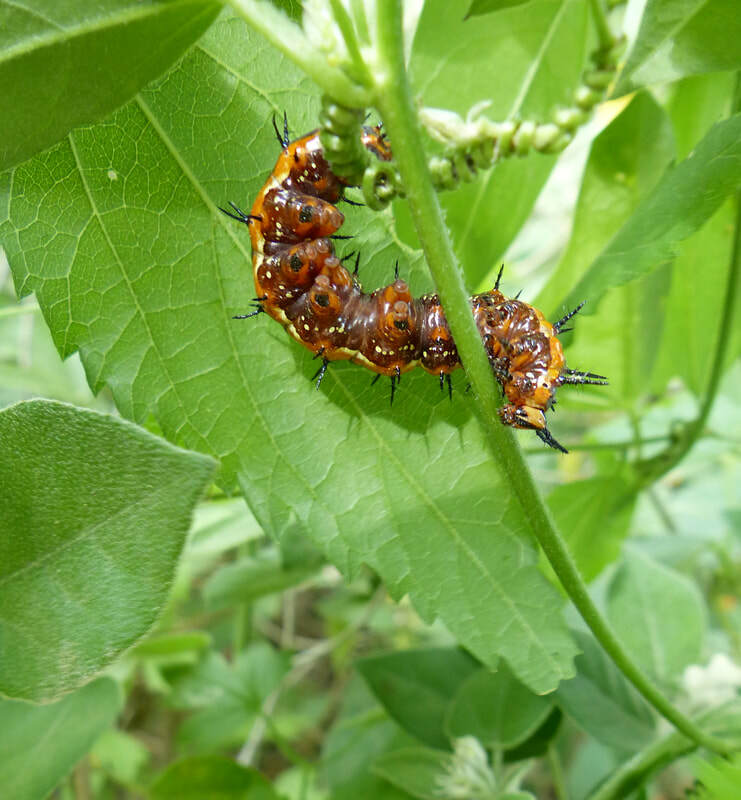 Preparing to PUPATE, a Gulf Fritillary Caterpillar attaches itself to a vine. A Gulf Fritillary PUPA hangs from a stem. The PUPA can still move. 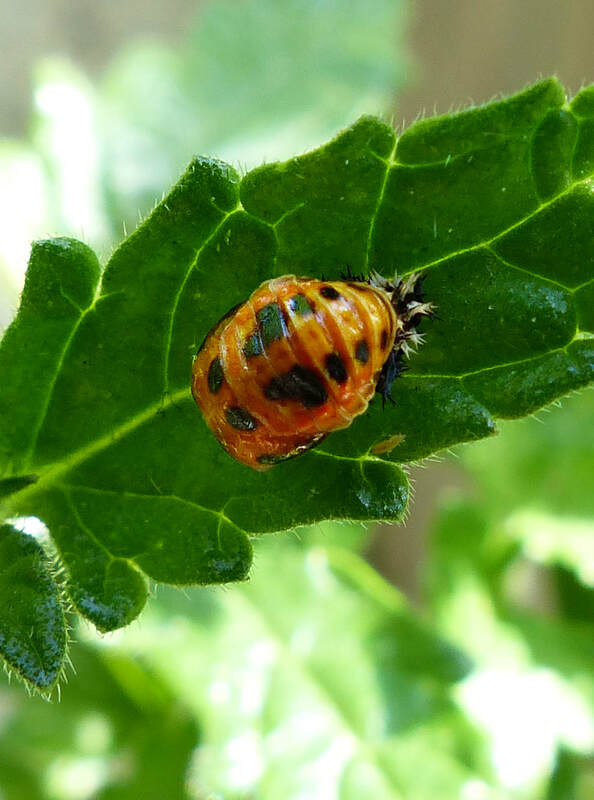 Lady Beetles or Ladybugs as they are often called, are so familiar we hardly pay attention to them, least their various growth stages. Here they are! 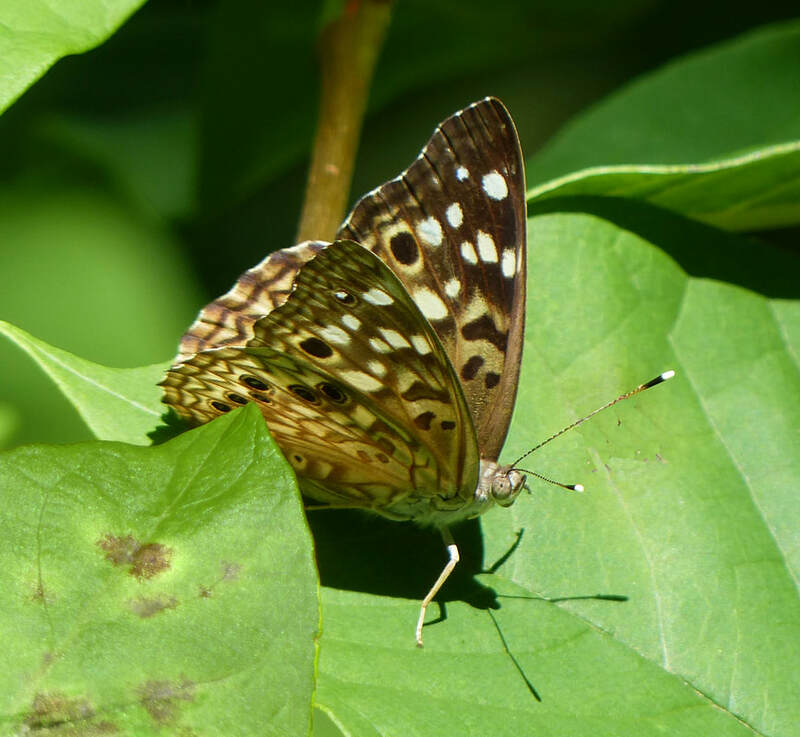 To get the whole picture, be sure to check out INCOMPLETE METAMORPHOSIS (see heading INCOMPLETE METAMORPHOSIS under INSECTS in the navigation bar at the top of the page)!